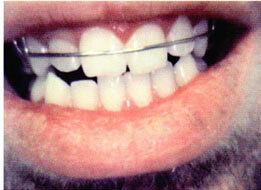 Dr. Sarett performs minor tooth movement with removable appliances and accomplishes the change desired for less money. Often, the appliances are worn only at night. This is a good option for someone who doesn't want to invest the time or the money on braces and who isn't looking for absolute perfection. Night guards are often used to prevent grinding at night and are used to prevent TMJ pain. There are many options including including soft or hard nightguards. Dr. Sarett will discuss the best option for each patient. There is a certified Invisalign dentist on Doctor Sarett's team.